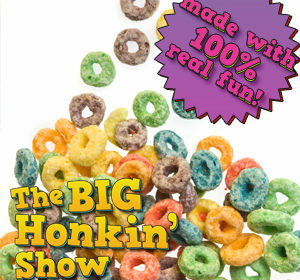 The final on-air Big Honkin Show. Thank you to everyone who has downloaded the podcast, listened live and supported the show over the past year or so. Your support has meant a ton to Buck and Steve. Keep the feed open, because you never know when we may be back. Buck and Steve call the creator of “adewha.” Sorry for the audio quality. September 11, 2010 – And a Master’s Degree…IN COMMUNICATION!!!! Steve has a cheerleading competition to MC. Flamboyant dancing is the way to go guys. There’s one guy who really wants to be treasurer. Wal-Mart woes and a pony explodes. September 4, 2010 – Fish Sticks? Is It Our Anniversary? July 17, 2010 – You’re a Cow! July 10, 2010 – TEAM UP! July 3, 2010 – GIT! GIT! Buck and Steve both have some experiences with hotels. It’s Buck’s brother’s birthday…so let’s tell an embarassing story about him. Steve reveals that he is not your typical southern guy as he talks about Bass Pro Shops. It’s a reunion of Buck and Steve after a week off on The Big Honkin Show. June 19, 2010 – Best of? June 5, 2010 – American History Adewha? May 29, 2010 – Georgia Football Baby!!!! Steve expresses his relief at the constancy of breakfast cereal mascots, his frustration with the kids not giving the rabbit Trix, and it all runs into a discussion about Ronald McDonald and clowns. It all leads to a call to Mama Honkin’. Yes, Buck and Steve figure out the phone, to call Mama Honkin and talk clown school. Then…BEAR WATCH!!! A guy shoots himself, a Real Life Super Hero takes it to a robber, and Steve needs to lose some weight. 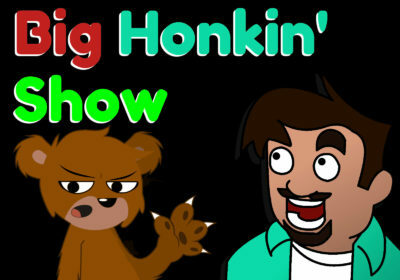 All that an more on this episode of The Big Honkin Show. There’s a long story…it revolves around a cord not being seen by Steve…and the show having no music. Then…about halfway through the show, Steve saw the cord, plugged it in…and presto…MUSIC! Buck and Steve talk about subjects ranging from giving CPR to a possum to how to properly speak to a fat lady. 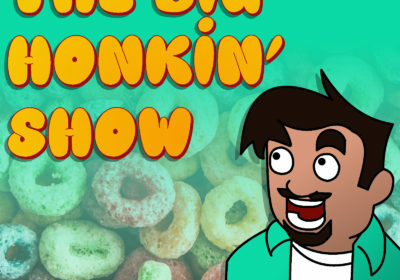 Buck launches the Fac-A-Thon, Steve almost swears, tasers, an opportunity for Steve to be tased, turning down that opportunity, some talk about peeing, Buck reveals that he’s an old fogey, a real life super hero, a solution to budget cuts for education, all kinds of fun on this episode of The Big Honkin Show. OH…THERE’S A SNAKE IN MY TOILET! April 10, 2010 – Surprise!!!! March 27, 2010 – Irritate Steve Day? March 13, 2010 – Mama Honkin! Not the best outing ever for our intrepid duo. Buck and Steve talk about yards sales, read some e-mails, discuss “family,” and celebrate a man who won a HUGE prize for killing rats. Psychic Crimes round us out on a high note just as the guys get going.